The Bishop’s Fossorial Spiny Rat was first reported by Avila-Pires and Wutke in 1981. It inhabits Brazil and is also endemic to this country. This particular species is currently (2003) listed as vulnerable. Their population is in decline as they are preyed upon by animals such as the maned wolf (Chrysocyon brachyurus). Habitat destruction plays another important factor in their decline. They are of a mottled brown-black colour. The tail of this species has black bands running to its tip. 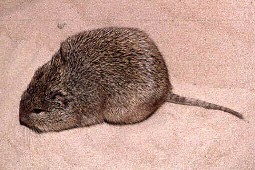 Bishop’s Fossorial Spiny Rat is a herbivore. Monocot plants were the most common food found in the feces of this particular species of rat. It suggests that Bishop’s Fossorial Spiny Rat is specialised in feeding on monocot plants. E-mail to add your Bishop’s Fossorial Spiny Rat related website.